Buit in 1998, Island Walk is nestled quietly in a private section of North Naples and just minutes from the breathtaking Gulf coast beaches. It boasts exceptional amenities, beautifully designed homes and unmatched waterfront properties. True to its name, you will certainly walk among the islands in this inviting community. Island Walk is a collection of homes, townhomes and attached villas that rest along the quiet shores of finger lakes stretching throughout the property. As a resident, you’ll be free to enjoy yourself with kayaking, canoeing and even fishing at your leisure. The community oozes a quiet atmosphere of a tropical haven. Featuring an exclusive “Town Center” complete with bank, car wash, post office, café and gas station. Experience all the beauty and scenery of the South Florida landscape with the convenience of living in a tight-knit community. You will have access to a sprawling, resort-style clubhouse, featuring a recreational pool, state-of-the-art fitness center, tennis courts and even a putting green. A year-round Activity Director works to assist all the residents in planning activities and events. Built in service and safety with a guard attending the front gate of Island Walk 24 hours a day, seven days a week. 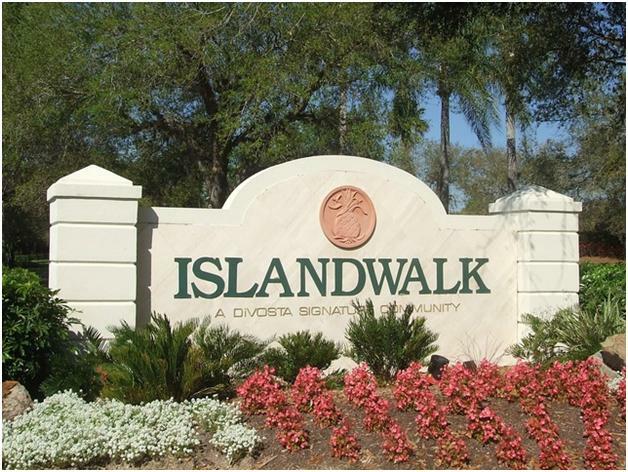 Living at Island Walk is like living in a never-ending vacation.